Spaghetti is one of the most popular forms of pasta, and it's used in dishes all around the world. Most spaghetti is made from durum wheat, so it's high in carbohydrates and includes all the nutrients found in refined white flour. Regular spaghetti is fairly neutral, diet-wise, but whole-wheat spaghetti can be a good source of fiber. The amount of spaghetti and whatever you put on top of your pasta is probably is what makes for a healthy meal or not. One serving is equal to one cup of cooked spaghetti or 2 ounce of dry spaghetti, which is about the amount of dry pasta that would fit through a soda bottle opening. Spaghetti is not a low-calorie food. It's made from grain, so it's energy-dense. Each serving has over 200 calories, mostly from 200 calories, mostly from complex carbohydrates, so it's important to watch your portion sizes if you're on a weight-loss diet. Keep in mind that it's rare to eat just the pasta so cheesy sauces and other high-calorie toppings can add lots more calories. A serving of spaghetti also has more than 40 grams of carbohydrates, so it's not well suited to low-carbohydrate type diets. Spaghetti is a good source of iron and is low in fat. 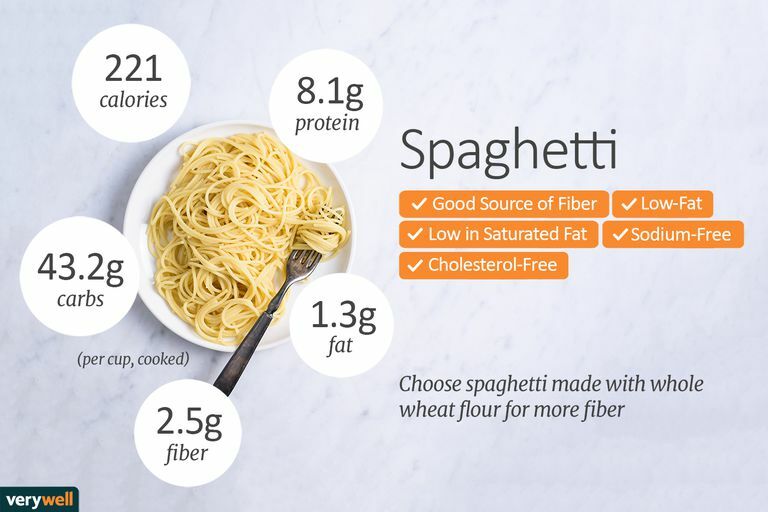 Spaghetti isn't bad for you because you do need carbohydrates in a balanced diet, but most people get more refined grains than they need, so you're better off with spaghetti made with whole wheat flour. In fact, about half of your daily grains should be whole grains. The reason whole wheat spaghetti is better for you is that it has more fiber than regular pasta. Fiber is essential for a healthy digestive system, and most Americans don't get the daily recommended amount, so eating more whole wheat pasta is a great idea. Is Pasta Bad for Your Health? Spaghetti isn't bad just because it's high in carbs. Your body needs carbohydrates for energy, especially if you're an active person. A balanced diet should have about half your calories coming from carbohydrates. In fact, the United States Department of Agriculture's ChooseMyPlate.gov, says that about one-quarter of a healthy balanced meal should be made up of grains such as pasta, rice, cornmeal or oatmeal. If you're following a strict low-carb diet, it's tough to fit much pasta into your meal plans. But it's perfect for a balanced diet and fits comfortably into a low-fat diet (as long as you keep the sauces and other toppings light). And Doesn't Pasta Have Gluten? Since spaghetti is usually made from wheat, it contains gluten, a protein found in grains such as wheat and barley. Gluten consumption is a problem for people with celiac disease, wheat allergies or intolerances, but for the rest of us, there's no need to follow a gluten-free diet. Some fad diets are based partly on avoiding gluten, but they're not based on credible scientific research. If you do need to avoid gluten, you can find gluten-free pasta made from corn or rice. It's still high in carbohydrates and has about the same number of calories as wheat pasta. It's also considered part of the grain group and, nutritionally speaking, isn't any better or worse for you than regular pasta. How Does Spaghetti Compare to Other Types of Pasta? There are many sizes and shapes of pasta, including noodles, shells, macaroni and so on. Some, like spaghetti, are usually served with sauce, but other types of pasta are used as the main ingredients in soups, and casseroles. As far as nutritional value, any type of pasta is going to be similar, as long as the serving size is the same. Top your spaghetti noodles with a tomato sauce such as marinara, Fra Diavlo, or regular spaghetti sauce. Make your own, or look for brands that are a little lower in sodium, especially if you are on a sodium-restricted diet. Add extra veggies and mushrooms to add flavor and bulk to your meal without adding many extra calories. Serve your spaghetti with a green salad on the side for even better nutrition. If you haven't tried whole wheat pasta yet, keep in mind it has a stronger flavor and different texture than regular spaghetti. Some people like it right away while others need to eat whole grain spaghetti a few times before acquiring a taste. United States Department of Health and Human Services and U.S. Department of Agriculture. "2015 – 2020 Dietary Guidelines for Americans." 8th Edition. Published December 2015.